For the second consecutive year, Keith Anderson’s art graces the limited-edition Woodford Reserve Kentucky Derby bottle. Much like a first-place finishing jockey, Anderson had his unwavering eyes on that prize for years. A local Louisvillian artist, Anderson worked at Brown-Forman (parent company of Woodford Reserve). He left, but returned, drawn back by the possibility of crafting artwork for the commemorative bottle. With his position in the cafe and catering department, Anderson had access to the right decision-maker: Mark Bacon, senior vice-president and managing director Woodford Reserve at Brown-Forman. In the hope that he could prove himself worthy of the honor, Anderson approached Bacon to discuss his art. Anderson expressed his confidence of one day designing the label and followed that up by sending him his portfolio. Impressed with what he had seen, Bacon told him that maybe it could happen one day. “Well, little did I know it was gonna be that year,” says Anderson. Bacon surprised him with the news at a team meeting in the cafe. 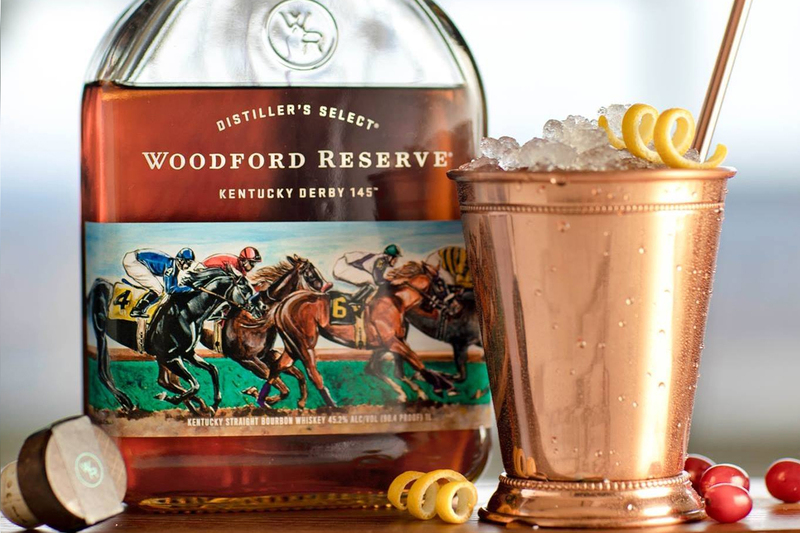 For the 144th Woodford Reserve Kentucky Derby bottle in 2018, Anderson found inspiration in the explosive energy of the horses emerging at the start of the race. This year the inspiration is from further into the experience. “It’s like you’re standing on the track, but they’re going by you. It’s a different perspective,” he explains. Anderson’s commemorative 2019 Kentucky Derby bottle marks the 20th anniversary of Woodford Reserve’s special derby releases. 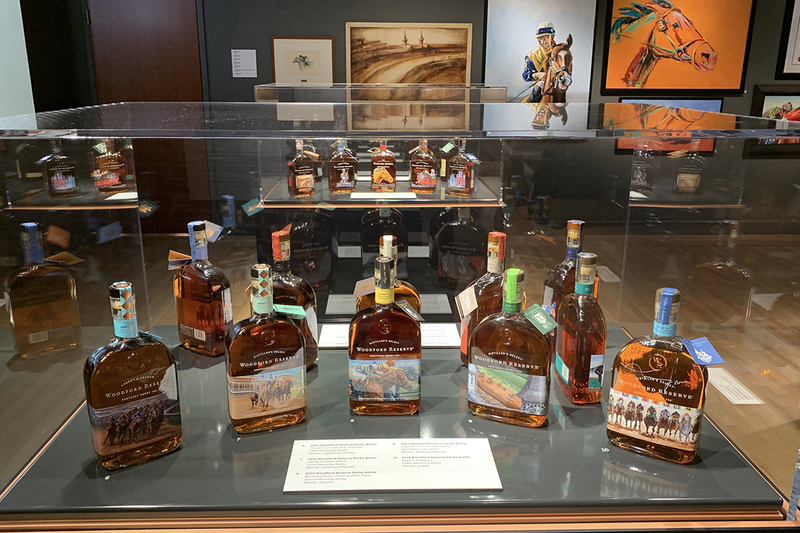 In view of this occasion, a special year-long exhibit displaying all twenty bottles is taking place at the Frazier History Museum in Louisville, Ky. The museum is located in the “Whiskey Row” district of downtown Louisville. In 2018, it became the official starting point of the Kentucky Bourbon Trail® tour. Anchoring the bourbon experience is the permanent “The Spirit of Kentucky®” exhibit which spans most of the third floor. The exhibit provides an in-depth look at bourbon whiskey including its history and production, interactive displays, numerous vintage bourbon bottle collections and even a display of all currently available Kentucky bourbon bottlings. Moreover, the museum store doubles as a Kentucky bourbon liquor store with select current bottles as well as a small collection of vintage and rare bottles available for purchase. Of course, this also includes the limited-edition Woodford Reserve Kentucky Derby Bottle for 2019. Also included in the “Spirit” exhibit are paintings commissioned by Hiram-Walker in the 1940s to showcase the brand’s whiskey barrels. In addition to the twenty derby bottle designs, original artwork, specially-commissioned $1,000 mint julep cups, vintage derby ads and other artifacts are on display. The Frazier Museum is located at 829 W. Main Street, Louisville, Ky. General admission tickets for adults are $14; hours are Monday – Saturday 9 am – 5 pm and Sunday Noon – 5 pm, closed select holidays. More information at the museum’s website.